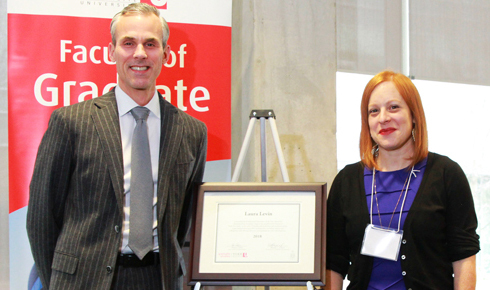 Laura Levin, associate professor of theatre in the School of the Arts, Media, Performance & Design at York University, was recognized with the Postdoctoral Supervisor of the Year Award from the Faculty of Graduate Studies (FGS). The award honours professors who demonstrate exemplary support for postdoctoral scholars at York University, exceeding general supervisory expectations. She received the award at the Postdoctoral Welcome Reception on Nov. 29, presented by Tom Loebel, dean of the Faculty of Graduate Studies. The event brings together postdoctoral researchers and their supervisors from across disciplines, coming together in part to recognize the wonderful contributions postdocs make at York. Levin’s research and teaching focus is on contemporary theatre and performance art; performing gender and sexuality; site-specific and immersive performance; performance and urban space; digital and intermedial performance; and disciplinary genealogies in performance. In July 2018, she was appointed director of Sensorium, a research centre for creative inquiry and experimentation at the intersection of the media arts, performance and digital culture. Upon receiving the award, Levin spoke about the importance of synergy between a prospective postdoctoral scholar’s research and that of their proposed supervisor, as well as the intersection this has, not only on grant applications, but on cultivating collaboration and co-operation. “I’ve come to really appreciate how synergy – both as an idea articulated in a grant application, and more significantly as a set of shared activities and commitments performed over time – also allows us to think about what postdoc-supervisor relationships can be at their best,” she said. The Postdoctoral Supervisor of the Year Award recognizes professors who: serve as role models for intellectual leadership and professionalism in research; provide an exemplary environment of support for professional skill development in research; promote and model a climate of respect and collegiality; and offer advocacy and guidance in long-term personal, professional and career development. More information is available at gradstudies.yorku.ca/postdoctoral-fellows/supervisor-award.